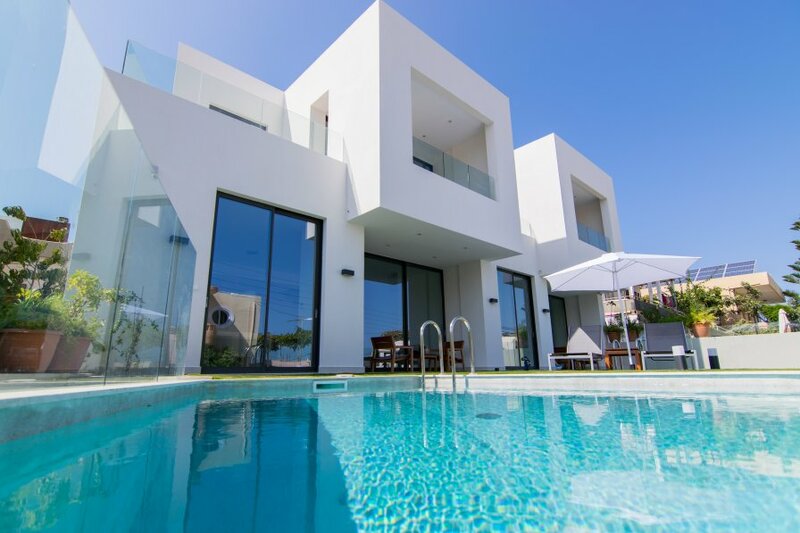 Stylish newly built villas ‘’S & K’’ are 2 villas next to each other (in 2015), 200m from the only sandy beach ‘Kalamaki’ that is so close to Chania town. Modern architecture, beautiful furniture and high standard quality materials have been put in this villa for you to enjoy. You owe it to yourself after a tiring year to have some private and relaxing time with your friends or your family. Plan your perfect vacation in this villa, only 6 km from the Venetian port of Chania, a city well known for its narrow shopping streets and waterfront restaurants. The villa is for 8 people but can accommodate up to 10 and it has 200 square meters of living space.Outside of the villa you can find a small private pool with sun loungers, umbrellasand sea views. It has four bedrooms with satellite TV which 3 of them are with en suite/bathrooms with shower.At ground level there is a living room and a dining area. Next to it there is one bedroom and another at the upper floor with a hydro massage and a private balcony. On the same floor there is a twin bedroom with private balcony and there is a master bedroom at the lower floor of the villa. The kitchen is fully equipped with anything you might need for your meal preparation, there is a laundry room and the younger members of your company will have fun at the media room and playroom with free WIFI available in the villa. If you have a car, you can lock it up at the garage with one car space and direct entry access to the lower floor of the villa. At 2 minutes walking distance from the villa you can find restaurants, supermarkets and cafes. Living room with large windows (5m high) with SMART TV, boarding games, high quality furniture, a dining table with comfortable chairs, a fully equipped high standard kitchen with microwave, washing machine, filter coffee, espresso machine etc. One master bedroom with private balcony, air-condition, safe,SMART SATELLITE TV and en suite bathroom with Jacuzzi, one large bedroom with twin and en-suite bathroom with private balcony,air-condition and SMART SATELLITE TV.